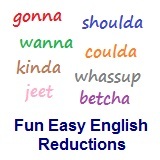 ﻿ Fun Easy English - new-american-english-reductions-reduced-words-topic-word-you-dont-you-doncha. In this lesson you will learn the American English reduction doncha. Doncha think that exam was hard? Don't you think that exam was hard? Doncha wanna go to the game today? Doncha think you should turn off the TV and study? Doncha think she is the sexiest girl in class? Doncha want to eat your dessert? This is an American English reduction which is used in a variety of situations. Reductions, such as doncha are not real words in English.